When performing a service, the provider is often times caught in a quandary between price, time, and quality. The Triple Constraint Theory of Project Management states that one is given the options of Fast, Quality and Cheap, and told to pick any two. The triangle of triple constraints reflects the fact that the three properties of a service are interrelated and it is not possible to optimize all three. One option will always suffer. This dilemma is no different in operating a small business because the owner can’t be everything to everybody. So the question becomes how you can manage this issue. In order to further expand and relate this issue, my man Josh at joshorourke.com gave me the idea to illustrate this concept with Mexican restaurants since I love Mexican food this applies. If you want to provide a service cheaply in order to gain economies of scale, then Taco Bell is the model. This method provides inexpensive products with occasional inferior ingredients or service but the customer gets what they want a fast, cheap meal to go. However, if you wish to provide a service with a fast turnaround time to move customers through the pipeline then Moe’s Southwestern Grill is your answer. Everyone loves the greeting of “Welcome to Moe’s.” You get to have food prepared quickly in front of you and then off to your seat to devour the food. Lastly, an Authentic Mexican Restaurant usually gives great service and delivers high quality products that provide value to the customer. Imagine sitting at a table prepped with fresh chips and salsa, ordering a wicked awesome chimichanga, and maybe a side of guacamole while listening to a Mariachi band. In the end, all of these options have their place and purpose. Unfortunately we can’t fully combine all three aspects to make the definitive perfect product/service. Provide a service or product fast and to a high standard, but then it will not be cheap. Provide a service or product fast and cheaply, but it will not be of high quality. Provide a service or product with high quality and cheaply, but it will take a long time. 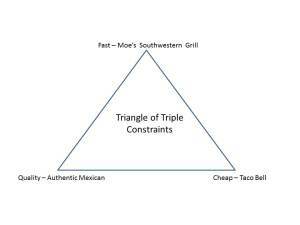 The Triangle of Triple Constraints does not provide a quick and easy solution. Especially when you are just starting a business and need clients yesterday. The trick is to understand your audience and give them what they expect. Setting this direction for your business is a direct reflection of your vision development process. Once you have established a vision for your company then you can use it as “bowling-lane buffers” to keep your company on course moving toward the goals. Lets try to stay away from the distraction of the next shinny object. How will you use the Triangle of Triple Constraints to develop your product or service?